Convenient medication packaging saving you time, money and from potential errors! BETTER HEALTH! Blister packs are proven to help patients remember to take medications consistently and on time, thus, they end up with better health outcomes. SAFETY! 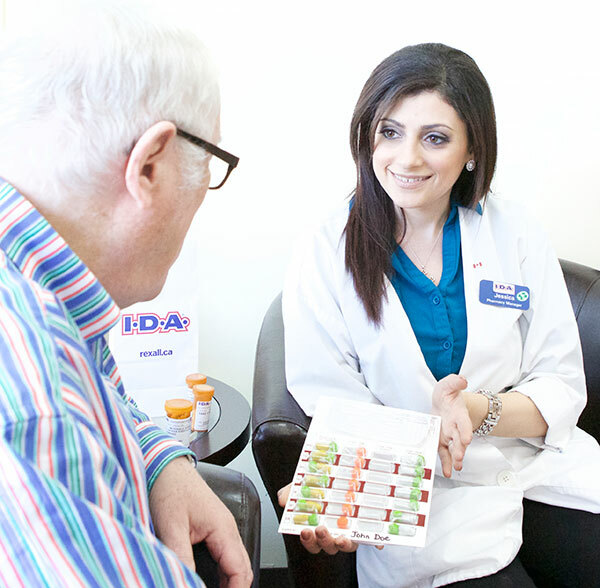 The pharmacist organizes your medications in a way that avoids drug and food interactions – ensuring you get the most out of your medication! Also, our packs go through a “triple check system” – 3 sets of eyes will check your dosette for accuracy, giving you peace of mind when taking your prescriptions. SAVE TIME! Do you do your own medication organizing at home? Why not let us do the work for you? This will free up special time that can be better spent with family and friends or doing the hobbies you love! CAREGIVER HELP! Are you a caregiver to a loved one and responsible for their medication regimen? We have many caregivers who love this program as it is one less thing on their list they have to be concerned about. Instead of you doing the organizing, we do it for you and deliver it to the patient – so this is one less duty and stop you have to make! CONVENIENCE! All of your oral medications (including your vitamins and supplements) are in one location, with a full list of doses and directions printed on the side. This is great for doctor or hospital visits. Also, we DELIVER the packs right to your door FREE of charge! SAVE MONEY! We waive special copays for our blister pack patients. Call our store for details!